The success of higher education in England is underpinned by the principles of institutional autonomy and academic freedom, and the new arrangements build on these strong foundations. 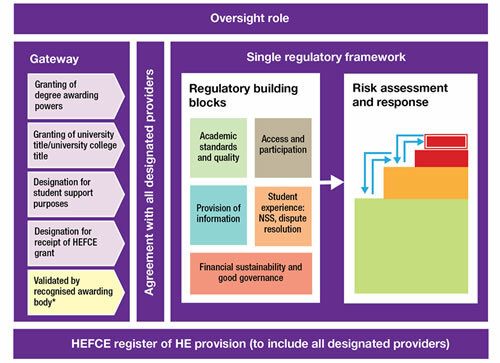 The Government has asked HEFCE and the Regulatory Partnership Group (RPG) to implement them within existing legislation, while recognising that a new legislative framework will be required in the longer term. implementing further changes to student number controls, including extending them to alternative providers from 2014-15. The Government has announced that it intends to delegate to HEFCE responsibility for the process of approving designation of HEFCE-funded universities and colleges, and for providing assurance that the agreed terms and conditions are met. Eligible courses at these institutions are and will continue to be designated automatically, allowing students to access student support. Institutions will not be required to undergo a separate designation process. This means that in practice there will be little change for existing institutions, and no additional administrative burden. This last piece is a critical one. Whilst there are new requirements on alternative providers it is claimed there will be no extra burden on universities. To achieve this the changes to the Financial Memorandum will need to be modest. And it is not at all clear that any of these changes will leave us with a reduction in regulation. At some point the focus of higher regulation partnership working moved from seeking to reduce the burden on institutions to concentrating “on policy, strategic and operational issues arising from the development of the new funding and regulatory regime for higher education.” This is a matter of significant concern given the many competitive and regulatory pressures universities are under. So whatever happens in this latest iteration it is vital that the promise of no additional administrative burden is delivered. Then we can move to actually reducing the level of regulation.